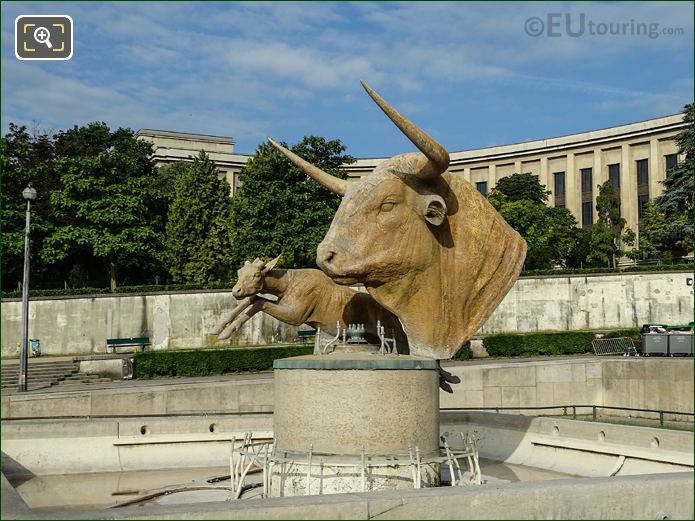 The Jardins du Trocadero are a free public park in the 16th Arrondissement of Paris, with its most striking feature being the famous Trocadero Fountain, also called the Fountain of Warsaw. This first HD photo shows part of the Fontaine du Trocadero looking over this towards the Eiffel Tower on the opposite bank of the River Seine, yet sometimes this fountain is called the Fontaine de Varsovie, which in English translates to the Fountain of Warsaw. 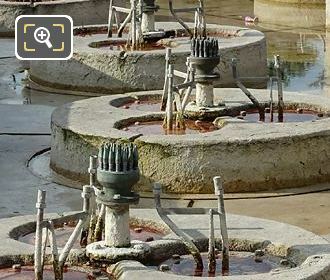 Although the gardens themselves were first laid out for the 1878 World Fair in Paris, which did originally have a fountain, these were completely redesigned for the 1937 World Fair, which was called the Exposition Internationale des Arts et Techniques dans la Vie Moderne. The re-design of the Trocadero Gardens and its cascade fountain were by the architect Roger-Henri Expert who was assisted with the task by Adolphe Thiers and Paul Maitre, in readiness for the International Exhibition when the new building of the Palais de Chaillot was constructed. 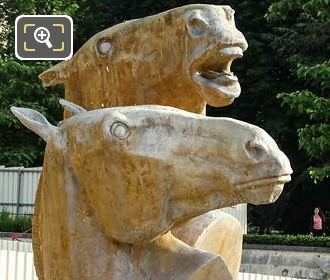 Several different recognised sculptors of the time were also commissioned for the task of producing new statuary, like the two that you can see in this photograph, which are located closest to the Palais de Chaillot and on the opposite side of the fountain there are another two by other artists. 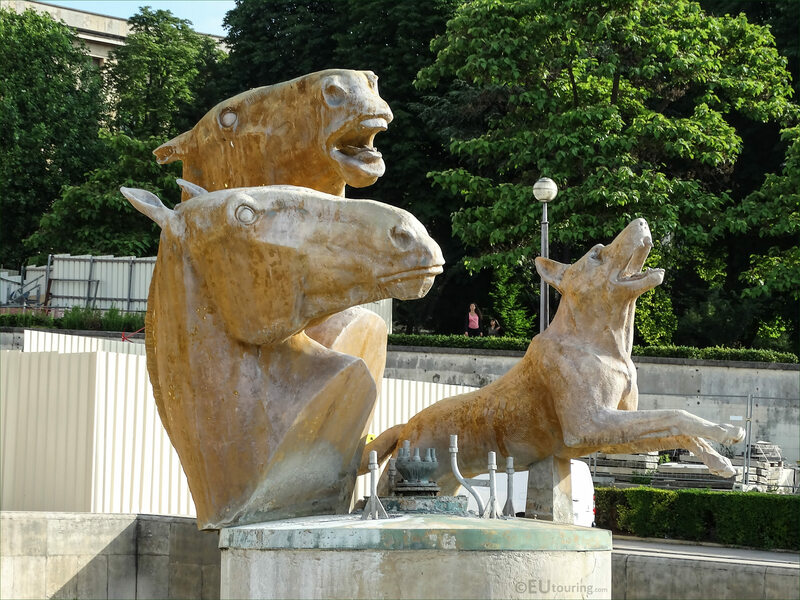 These particular statues like this one of the Horses and Dog were to replace others that were originally sculpted for the former Palais du Trocadero and its gardens, and were saved from destruction when the old palace was demolished, with some of these now able to be viewed within the courtyard of the Musee d'Orsay in Paris. Probably one of the most striking features of the Fontaine du Trocadero are the water cannons that are positioned at the top of the fountain where they project water down the central basin to a length of approximately 50 metres, and this view looks as though they are going to fire at the base of the Eiffel Tower. The Trocadero Fountain is actually the largest water fountain in Paris, which is seen by many millions of tourists every year, and being the only fountain still remaining from the Universal Exhibitions, they still function in the same way as they were designed for the 1937 World Fair. 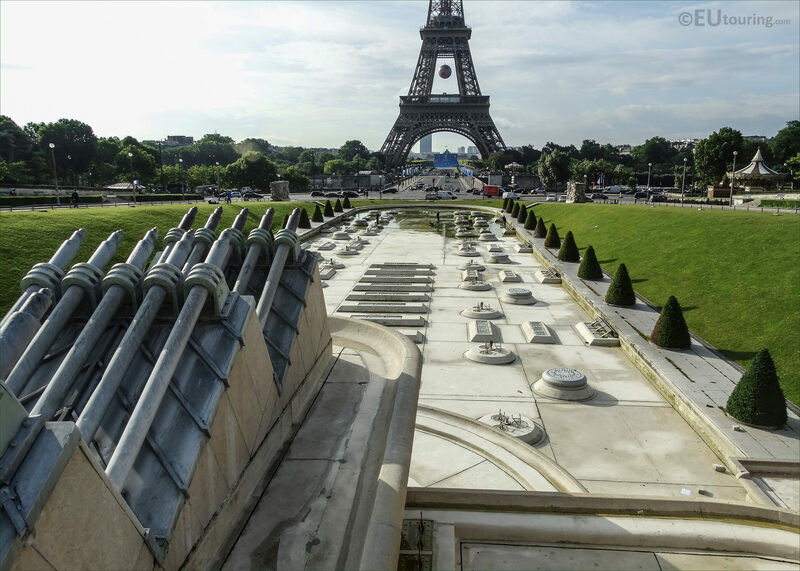 However, as with many areas of Paris, for several years some of the major tourist attractions have been undergoing renovation and modernisation works, which included a modern pumping system being installed in 2011 for the Fontaine du Trocadero, making it more eco-friendly. 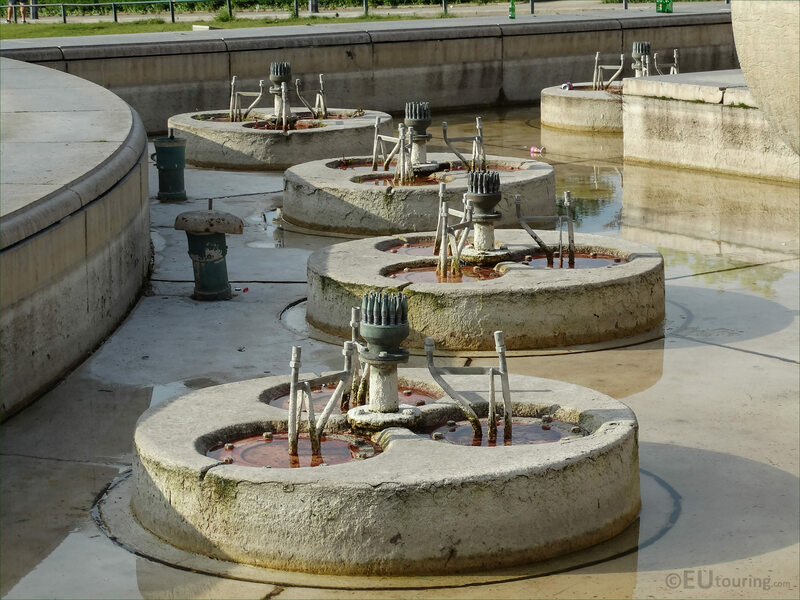 So in the above image you can see a close up showing some of the mechanisms and pumping systems used to produce the magnificent effect of the water shoots and jets that make up the Fontain de Varsovie, or Warsaw Fountain, as it is also referred to. And here you can see some of the water features of the Trocadero Fountain in action, which actually include 56 sheaves of water, as they are called in aquatic terms, that spray up to four metres in height, plus there are an additional 12 reaching up to seven metres in height. 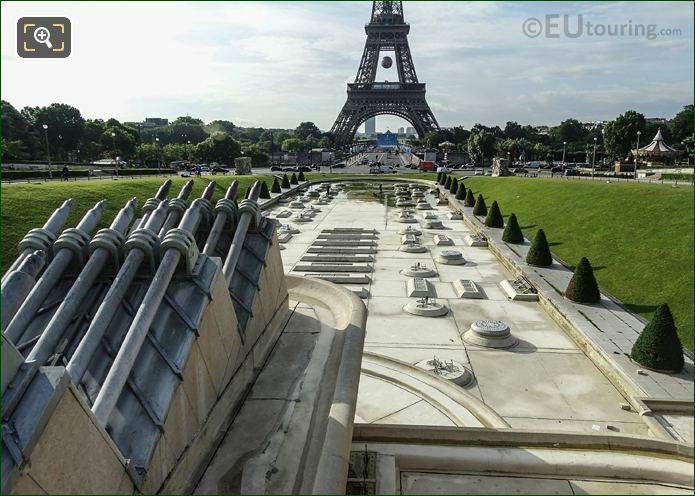 On top of this, there are the twenty water cannons arranged in four sets of five that you can see in this photograph, which are called oblique cannons and pointed towards the Eiffel Tower, they have a water firing range of approximately fifty meters down the fountain. 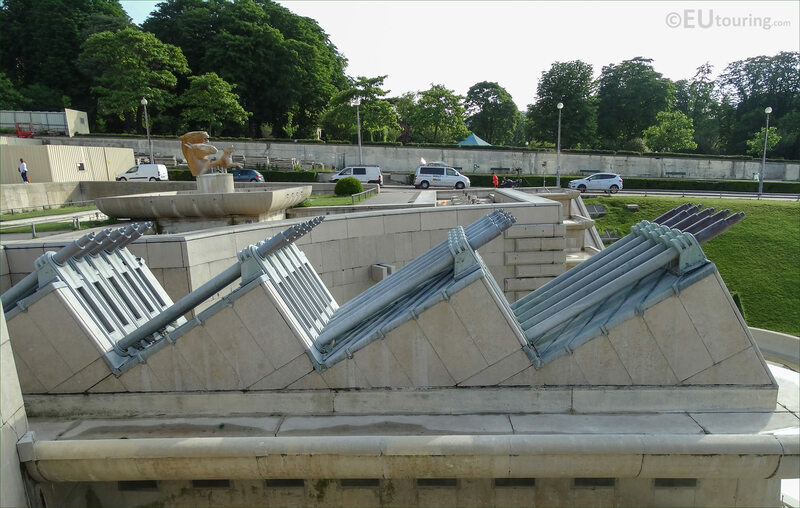 Because the Trocadero Gardens are positioned on the Chaillot Hill that slopes down to the River Seine, the architect Roger-Henri Expert envisioned the idea of a spectacular cascade effect fountain with numerous features, so hence why there are two square basins located at the top. Located within the two square pools of the Fontaine du Trocadero are bronze statues, with this one being the Bull and Deer, and as you can tell, these are positioned right near the steps that lead to the terraces of the Palais de Chaillot. Originally there was a fountain in the gardens of the former Palais du Trocadero classed as waterfall that had been constructed by Gabriel Davioud, yet when the palace was demolished to make way for the Palais de Chaillot you can see today, the fountain and the Trocadero Gardens were then also redesigned. 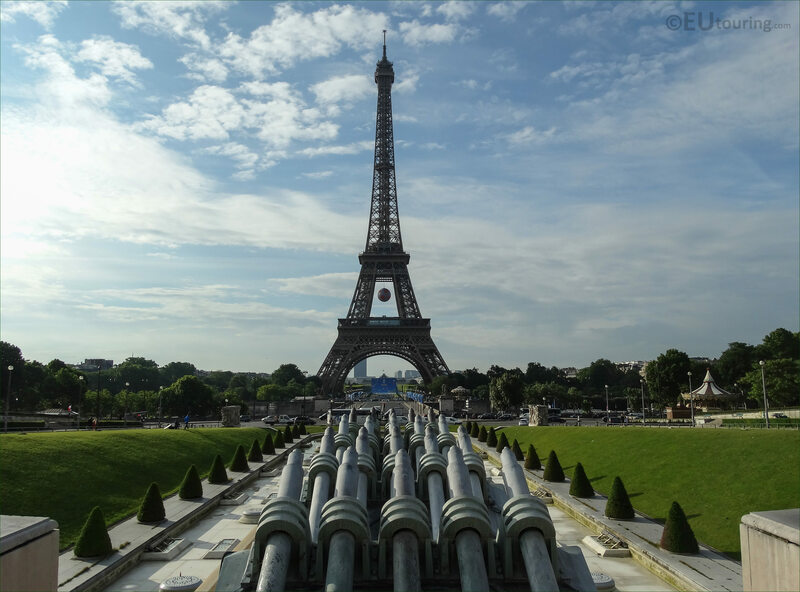 The new elaborate Trocadero Fountain was breathtaking for visitors when it was first inaugurated in 1937, and still looks just as impressive today, or even imposing when you see a view of the water cannons from this unusual angle. In fact, many electrical lights were installed within and around the Fontaine du Trocadero for the 1937 World Fair in Paris, which provided a great illumination and almost a theatrical show from dusk until dark where the gardens were a hive of activity. The water features of the Trocadero Fountain are still just as popular today as they were decades ago, although sometimes you can be unlucky when visiting, like on one occasion when we there and the basins had been drained for maintenance. 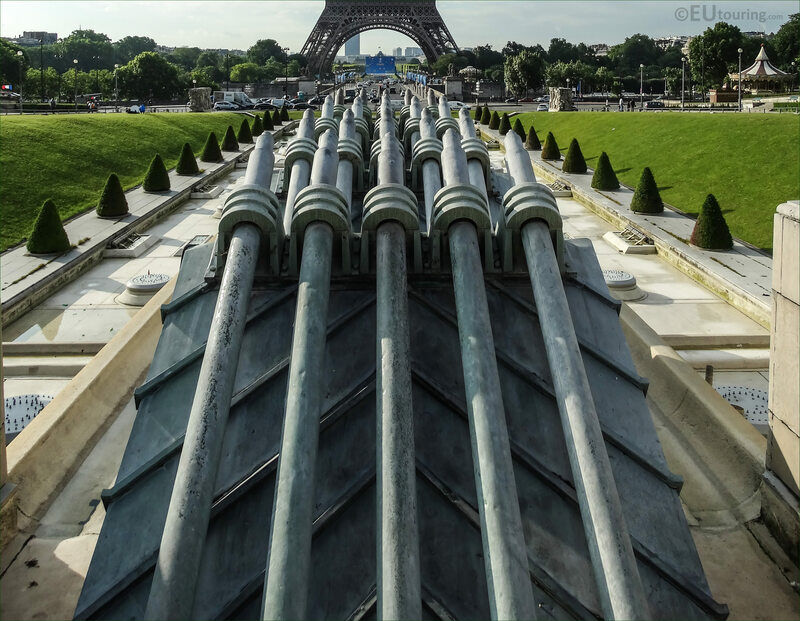 Yet for many it is the fabulous view from the top of the Chaillot Hill, or the terrace of the Palais de Chaillot towards the Eiffel Tower, that has become a must see for tourists while on holiday in Paris, the capital city of France. 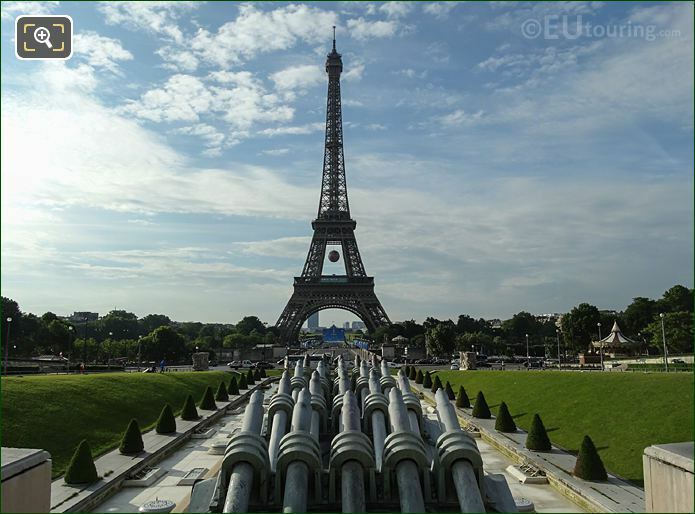 Although every time we have been to the Jardins du Trocadero, we have still not yet been lucky enough to see the water cannons, or oblique cannons as they are called, in action on the Fontaine de Varsovie, when they are projecting the water many metres down the central basin.